New Winship investigators in cancer immunology, Kavita Dhodapkar, MBBS, and Madhav V. Dhodapkar, MBBS. Madhav V. Dhodapkar, MBBS, a world-renowned expert in cancer immunology and translational immunotherapy, will join Winship Cancer Institute of Emory University on March 1, 2018, as the director of the new Winship Center for Cancer Immunology. He will be appointed as the Anise McDaniel Brock Chair and Georgia Research Alliance Eminent Scholar in Cancer Innovation and professor in the Department of Hematology and Medical Oncology in the Emory School of Medicine. For the past decade, Dhodapkar has served as chief of hematology, the Arthur H. and Isabel Bunker Professor of Medicine (Hematology), and professor of immunobiology at Yale University School of Medicine. An expert in the treatment of multiple myeloma, he also was co-director of the Cancer Immunology Program within the Yale Cancer Center. "The arrival of Dr. Dhodapkar at Winship Cancer Institute signals our commitment to the growing cancer immunotherapy research space," says Walter J. Curran, Jr., MD, Winship's executive director. "He will be a transformative Winship leader in this realm." Dhodapkar is credited with helping to define the role of the immune system in controlling early cancer cells. His research focuses on how the immune system regulates the progression from precursor lesions to cancer as well as the mechanisms of treatment sensitivity and resistance to cancer immunotherapy. "I have known Dr. Dhodapkar for over 15 years, and his work in immune profiling and immunobiology in cancer is at a world-class level. We are incredibly excited to bring him, his lab, and his expertise to Winship where he will lead a growing cancer immunotherapy program," says Sagar Lonial, MD, chair of the Department of Hematology and Medical Oncology and Winship's chief medical officer. 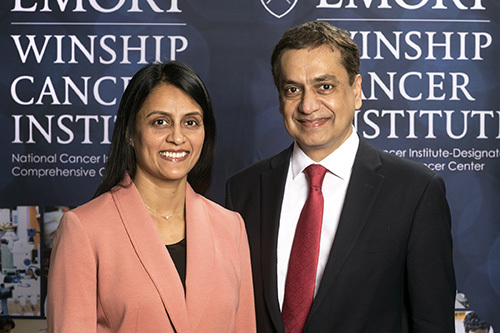 "Winship's reputation for excellence in cancer research and patient care will only be heightened by the arrival of Dr. Dhodapkar," say Mary and John Brock, philanthropists and long-time business and civic leaders. John adds, "We are so pleased that my mother's memory will be honored through this endowed chair. The expert, loving care she received at Winship was the impetus for our family's gift. We are confident that Dr. Dhodapkar will continue to make a difference for patients battling cancer and the families who care for them." "GRA is pleased to welcome Dr. Dhodapkar and his team to Georgia," says C. Michael Cassidy, president and CEO of the Georgia Research Alliance. "Cancer immunotherapy research has seen significant advancement in the recent years and we look forward to having Dr. Dhodapkar collaborate with our GRA Eminent Scholars in this expanding field of study." Dhodapkar earned his medical degree from the All India Institute of Medical Sciences in New Delhi, India. He completed his residency in internal medicine at St. Louis University and his fellowship in hematology and medical oncology at the Mayo Clinic in Rochester, Minnesota. Prior to Yale, Dhodapkar served on the faculty at Memorial Sloan Kettering Cancer Center and The Rockefeller University in New York. Dhodapkar has authored more than 100 scientific papers. He is a prior recipient of several awards including the National Institutes of Health Director’s Transformative Research Award and the National Cancer Institute Outstanding Investigator Award in 2016. Dhodapkar's wife, Kavita Dhodapkar, MBBS, a leading cancer immunology researcher at Yale, will also join the Emory faculty as an associate professor in pediatrics and director of the Pediatric Immuno-Oncology Program at the Aflac Cancer and Blood Disorders Center at Children's Healthcare of Atlanta. She will also become an active Winship investigator in cancer immunology.